250km east of Thunder Bay, near the shore of Lake Superior. 12 patents with mining rights covering 290ha owned outright by Landore. A large central core of mafic poor (<10%) nepheline syenite extending over a strike length of 8,000ft, and 500ft to 1400ft in width. Nepheline is used in the production of Laboratory quality glass. Exposures are topographically high and rocks show a peripheral zoning. The nepheline syenite zone is hosted in meta-volcanics belonging to the Coubran Lake meta-volcanic roof pendant. Towards the inner zone, the nepheline syenites become more leucocratic, coarser grained, and biotite predominates over amphibole. Relatively unaltered nepheline is present up to 40%. 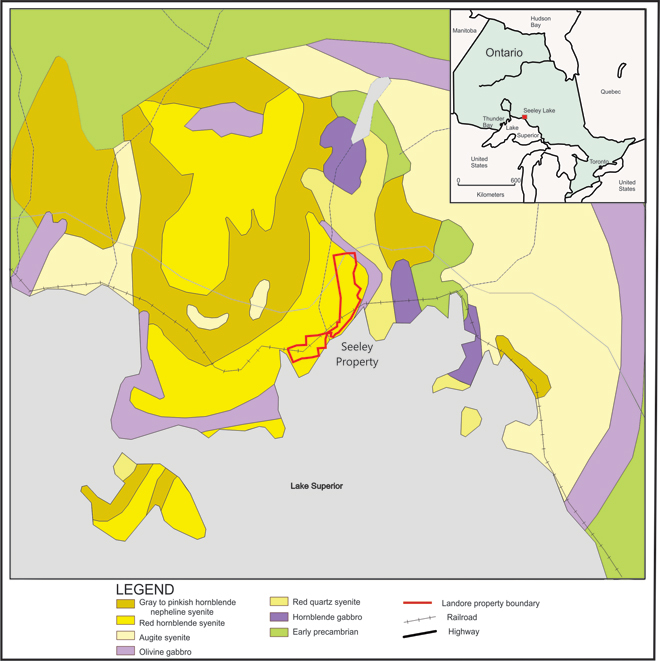 Several companies have investigated the area currently held by Landore for the nepheline potential starting in the 60's. Microscopic examination indicated that the removal of the iron-bearing minerals to an acceptable level may be difficult. However, most of the samples were from near surface, thus causing the alteration of the nepheline. Samples from below the weathering zone may yield better results.